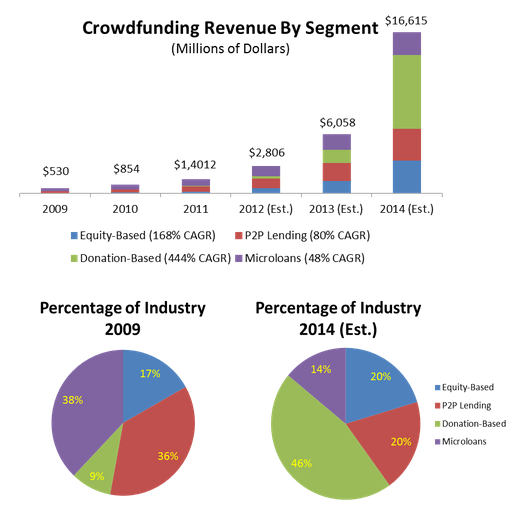 CrowdFunding generated $2.7 billion in 2012 and is estimated to generate $16.6 billion in 2014. Campaign such as Veronica Mars ($5 million+) Pebble watch ($12 million+) and Star Citizen ($2 million and then $8 Million+) are good examples of the power and potential of CrowdFunding. You can learn how and have a successful campaign too. But CrowdFunding can take on different meanings based on personal experiences and interpretations. We would like to know what CrowdFunding is for you by offering this contest to get your opinion. In the spirit of CrowdSourcing, and with the believe that from the collective crowd can spring wisdom unmatched by the wisdom and knowledge of "experts" - we'd like to get your "Crowd Wisdom". If you want to learn more click on: "what is CrowdFunding"
What is CrowdFunding ? Watch this video now! Join the largest Google Plus Community Now! Connecting people with talent, ideas, and stuff to sell to those that have the funds to send their way. Collecting smaller sums of money from a large number of donors not only generated a big pool of cash, but also a deep well of emotional investment from those voters. Crowd Funding is a new way to get working capital for new initiatives from many small investors instead of lending institutions and angel investors. Bridging the gap between the crowd and a great idea. Entrepreneurs seek guidance and funding for their startups. People want to be part of the next big thing. CrowdFunding is akin to asking your Facebook friends to help fund your venture — but the social sphere is much larger. CrowdFunding provides an additional option to get needed capital. In exchange, the company usually offers goods or products at a discount. You can add your definition by clicking on the CrowdFunding contest here. Be part of the Collective CrowdFunding community . BELIEF - The main reason people donate to CrowFunding campaigns is their belief in the product that is looking to be developed. They see a need, or feel a want for the product, and are willing to provide nominal financial support, to see it become available. REWARDS - Project creators inspire people to open their wallets by offering smart, fun, and tangible rewards . Tangible and intangible rewards given to backers (products, benefits, experiences and even equity). BELONGING - Crowd Funding is fundamentally grounded in humanity's desire to belong, to feel connected with their surroundings and to be part of something larger than themselves. STORIES - Projects are efforts by real people to do something they love, something fun, or at least something of note. These stories unfold through blog posts, pics, and videos as people bring their ideas to life. TRUST - The inner social group of family, friends, co-workers, close connections - have developed a bonding trust with the entrepreneur who is looking to develop their idea. More often than not, they are willing to show their trust and support financially. GOOD BET - You, your idea, and your virtues are a good bet. They want to be a part of your success. Why should you try CrowdFunding? (1) It provides access to needed capital. An entrepreneur may believe that outside of their own money and that of their close network, they can only raise capital from accredited investors, venture capitalist, and banks. This isn't the case. CrowdFunding is the needed alternative to fund a venture, and it can be done without giving up equity in the project or taking on debt. Rewards-based CrowdFunding campaigns allow entrepreneurs the ability to raise start-up capital from the general population in exchange for rewards. Getting a new project off the ground can be a challenging journey, which inherently comes with risks. Launching a CrowdFunding campaign can hedge these risks by limiting personal financial exposure. CrowdFunding, as it is today, allows an entrepreneur to gain market validation, avoid over exposed personal financial risks, and avoid giving up equity in a project. (3) CrowdFunding has other uses. It's not only for raising capital. Launching a CrowdFunding campaign is a great way to introduce a product and it's overall mission to the market. It is a cost effective and easy way to reach numerous channels. CrowdFunding can be used for market research, data gathering, publicity and expert sourcing. (4) It gives proof of concept to would-be investors. It can show possible large investors and also yourself that your project has merit by allowing to gain quantifiable metrics which validate your project. Having a successful CrowdFunding campaign can provide you with respect and credibility in the eyes of an angel or institutional investors. (5) CrowdFunding promotes CrowdSourcing and Brainstorming. Most entrepreneurs are well versed in their product. But no one can be an expert in all things. To achieve a successful CrowdFunding campaign, an entrepreneur has to be able to properly assess their strengths, weaknesses, opportunities, and threats. In the areas they are weak, they must be able to get the knowledge and expertise of those who are more learned in whatever topic they need help in. By having a CrowdFunding campaign, an entrepreneur has the ability to engage experts in various fields, and engage the crowd to receive comments, feedback and ideas. Good or bad, constructive feedback is extremely valuable. It can help an entrepreneur gain a fuller internal and external understanding of their product that were previously not considered. Moreover, it can serve to improve on the idea or inspire new ideas all together. What if the CrowdFunding campaign is not successful? Success or failure it is in an entrepreneur's best interest to start another CrowdFunding campaign. Life is full of lessons. It has been said, the best lessons are the one's learned through challenges. If you are successful with your Crowd Funding campaign - great! You can still use CrowdFunding to possibly fund another area of your project you had not previously focused on. You can also use the next CrowdFunding campaign to keep your project in the eyes of your future consumers. It's been said, but it is worth mentioning again - CrowdFunding is not only useful for raising capital. If you were unsuccessful, you have gained valuable information and knowledge to use towards your next campaign. CrowdFunding should not be considered a one-time shot. You can build on the areas of your campaign you were successful in and improve upon them further. In the areas of your campaign, which were lacking, you can revisit them, tweak and revise for better results the second time around. At CrowdFunding Planning, we focus on utilizing our proven 7 part CrowdFunding Framework to provide you with the ability to strategically plan your campaign so you have the ability to quantify its metrics. Without a plan, success or failure, it would be difficult to know for certain what worked, what didn't work and what can be useful to know for your future endeavors. Learn how to build a "network" and a " crowd "
Develop Business Intelligence and Market Analytic.